I remember my husband and I being so excited to try out a restaurant. It was our first time dining out with our son since he learned how to walk. We planned out everything perfectly (so we thought). We packed his favorite meal and brought along some books in case he got bored. Well let’s just say our dinning experience turned out to be anything but pleasurable. Our little guy decided to have a meltdown even before our entrée arrived. We were left scrambling for the bill and packed up our food in to-go boxes. Were we destined to a life of take-out and eating at home? My husband and I were determined to not let this experience get us down. Here are a few tips and tricks that helped us along the way. I started reading the book “French Kids Eat Everything:” This is such a great book that really helps lay out the foundation to raising healthy eaters and kids that behave at the dinner table. One of the “rules” that really helped us was to “always eat family meals together.” This is something that’s also really common in the Hispanic culture. When I would visit my grandmother in Colombia, she would spend hours cooking for the entire family–many times lunch would last two hours. But back home, between our busy work schedules, sometimes we wouldn’t eat until after we put the baby to sleep. I now make it a point to eat earlier and have our son join us at the table. We simply prop up his high chair next to the table and engage him in our conversation. I like to pretend we’re at a restaurant. 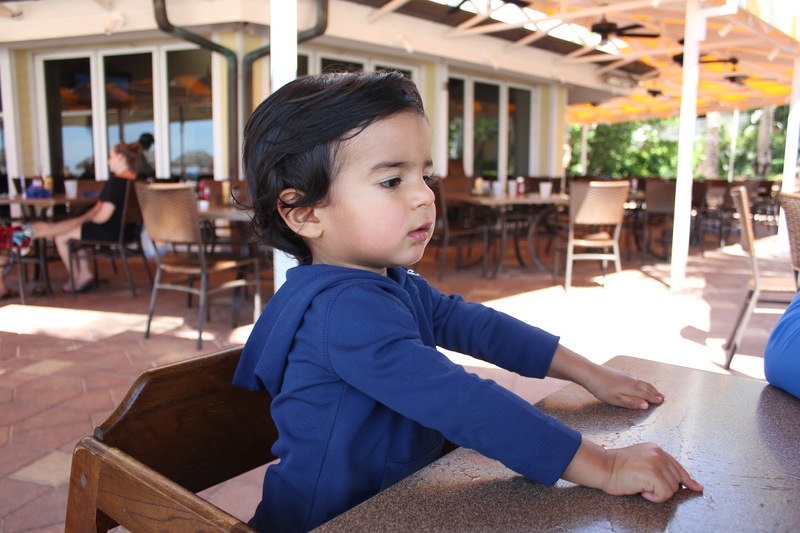 Pick a Family Friendly Restaurant: This always helps take the pressure off when dinning out for the first time with your little one. In my opinion, the louder the restaurant the better. We also like to sit outside (if there’s outdoor seating), which helps keep our son entertained. He’ll look at the birds or the people walking by. We also like to pick restaurants that have fast service. Another tip is to go when it’s typically slow, as oppose to going in the middle of lunchtime. Bring Fun Toys: We like to bring books or toys he doesn’t normally play with on a regular basis. This way it’s new and intriguing to them. Ask for the Check Early: If your little one is starting to get antsy you can ask for the check when they settle down the food, in case you need to make a quick dash for the door. Take Turns: If things start to get ugly, sometimes all they need is a little change in scenery. So while one parent finishes eating, the other one can take him/her for a walk around the restaurant or for a diaper change. Hope these help. Do you have any tips for eating out with a toddler? I’d love to hear them.